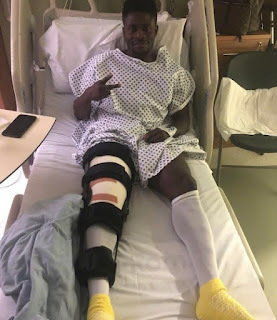 Super Eagles striker Obafemi Martins has undergone a successful surgery on his ruptured quadriceps tendon in the United Kingdom. Obafemi Martins suffered the injury during Shanghai Shenhua’s Asian Champions League game against Kashima Antlers which ended 2-2 in midweek. A Shanghai Shenhua’s Instagram account posted a picture of Martins’ on the bed with his right leg heavily strapped. “Martins had a successful surgery in the UK,” the account wrote. The message and photo were also posted on Twitter on Sunday. The injury rules Martins out of a possible call-up to the Super Eagles for the 2018 FIFA World Cup in Russia in June as he will be out for up to seven months. Martins scored four goals in seven games in all competitions in the new Chinese season before he got injured.